Shakespeare's Birthplace has been welcoming visitors for over 250 years. This is where it all began. William Shakespeare was born and grew up in this house. He ate meals in the hall and he slept and dreamed in these rooms. 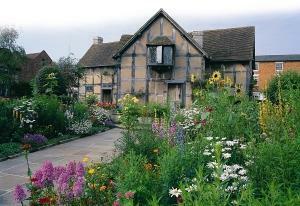 Shakespeare also spent the first five years of married life in this house with his new wife, Anne Hathaway. Shakespeare's Birthplace is a fascinating house that offers a tantalising glimpse into Shakespeare's early world. It's a special place that everyone should see at least once in their lifetime. Explore the Shakespeare’s family home and glove making business. Discover the world that shaped the man. Stand where genius was born. Enjoy live theatre every day with costumed actors performing excerpts from Shakespeare’s plays. New for 2013 - Delightful cafe serving locally sourced, home-made fare with views of the Birthplace and gardens. Shakespeare's Birthplace has been welcoming visitors for over 250 years. William Shakespeare grew up here and he played here. He ate meals in the hall and he slept and dreamed in these rooms. 1. Shakespeare's Birthplace, Anne Hathaway's Cottage, Hall's Croft and Nash's House & New Place are open daily throughout the year except Christmas Day and Boxing Day; Mary Arden's Farm is open from 21 March - 31 October. 2. Allow about 45 minutes to 1 hour to visit each house, except Mary Arden's Farm, which is on a much larger site and can take two hours or more if wished. 12 months FREE entry for a year from date of purchase! BIRTHPLACE PASS: Includes entry to Shakespeare's Birthplace, Nash's House & New Place, Hall's Croft and Shakespeare grave's at Holy Trinity Church. FIVE HOUSE PASS: Includes entry to Shakespeare's Birthplace, Hall's Croft, Nash's House & New Place, Anne Hathaway's Cottage, Mary Arden's Farm and Shakespeare's grave at Holy Trinity Church. * Children (5-15 incl.) will not be allowed to visit unsupervised. 16-17 year olds may be required to prove their age. From Stratford Tourist Information Centre proceed to the top of Bridge Street. Turn into Henley Street which is to the right of Barclays Bank. This street is pedestrianised. Continue up Henley Street and Shakespeare's Birthplace can be found on the right-hand side. Q30. The Birthplace is presented as it would have been in Shakespeare's time. Lit only by canlelight and the glow from the fires.